Update 2017: Why buy business 1800 number service for from UniTel Voice? Because it’s a no brainer. If you are a small business owner there are many reasons to get a 1800 number. If though providing you customers with the ability to call your business toll free is no longer as important as it once was, there are still many benefits to getting a toll free number including, a nationwide presence, credibility, and most importantly number portability. Getting a toll free 1800 number for your small business gives you big business appeal. If you buy 1800 number service it gives your business a nationwide appearance. Buying toll free 1800 numbers to use as your business’s main lines is a smart move because of the flexibility toll free number service offers. If you are looking to easily set up an inexpensive 1800 number for your business look no further than UniTel Voice. You can buy 1800 number service at a low-cost rate with all the small business virtual phone system features you need to make your growing company, new startup or home-based business sound more professional and stay connected. UniTel Voice can help you find the perfect business 1800 number loaded with the features and service you need to get up and running today. 1. What does toll free number portability mean and why does it matter? Make sure the 1800 number you buy is forever portable, meaning you own the number. In other words, if you decide to cancel your service with your current phone company – you can take your number with you to your new toll free service provider. When you buy a 1-800 number you want to make sure that you own your business number and can port it to any phone company at any given time. This is important because if you move, change business phone systems, or your current carrier raises their rates, you can easily move your number to another provider without service interruption. With UniTel Voice, you own your number and can port it to another provider at any time. 2. How much does it cost to get a 1800 number and set up toll free number service? Now and days, toll free number service is much cheaper and loaded with way more features than when 800 numbers first became available (which was back in the 1960s). Today you snap up the perfect toll free number and business phone service for just $10 per month – no setup fees or long term contracts. 3. Where is the best place to buy 1800 numbers and setup fast, easy, and affordable service? Look no further than UniTel Voice toll free number service. 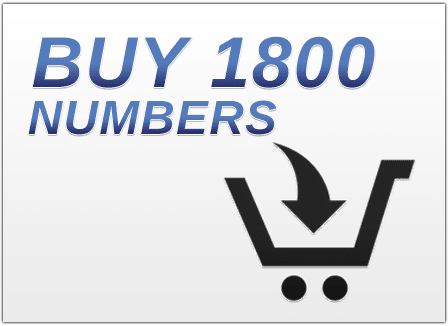 You can buy cheap 1800 numbers for a very low rate and get all the phone system features you need (e.g., voicemail, auto-attendant, call forwarding) with excellent call quality and industry leading network reliability. The customer service team at UniTel Voice has helped tens of thousands of small business owner’s sound more professional and stay connected with 800 toll free number services. Get toll free telephone numbers and purchase 1800 number service at a low rate with UniTel Voice.